Now, that's not true at all. We are doing a hell of a lot of it. Also, no need to get excited. It's never hard to shut up. The question is, should it be required? Sure, but as usual in this sort of conversation, we're not talking about that. Anyway this is a bit off topic now. I keep asking myself if it is off topic, and on its face such a discussion seems a derail. But then I think that the thread is about the 2018 elections, and discussions of what issues and emotions might be leveraged by either side to secure an election victory seems totally appropriate and on-topic. I'm not sure any of this is true. I can't say definitely that it is false either. Have you gone over the demographics and all the polling? Say in Florida to be specific? Or are you just wildly speculating? As far as I could see, neither base was all that excited. Trump was plainly a racist idiot, and Hillary was just flat-out ignored except when she was on stage with the idiot (in the debates, where she plainly showed that she was both far more prepared, and more mentally stable). I'll point out immediately that the Bernie Stans were loud but ultimately not that great in number. They may have been a factor, given how remarkably close a few states were compared to the "Sanders" write-ins and Stein voters. But they were hardly definitive. I object to the use of the adverb "wildly", but beyond that objection, yes, I am speculating. If you know of a sure-fire study that tells us exactly what was going through DeSantis' mind when he made the statement at the root of this discussion, I will be happy to read it. Last edited by Distracted1; 1st September 2018 at 06:45 PM. No, as I said, I don't know either. I really don't have the info to take an educated guess. I was curious if you did since it seemed that you were positing a knowledgeable claim. But hey, you could be right. I know that African-American turnout dropped for Hillary. Beyond that I can't say much. I like Hillary a lot. But I also think she made a lousy candidate. She's about as inspiring as warm milk. Trump would have probably lost if he had faced Biden...I don't know about Bernie. Frankly the most interesting politician on the Democratic side of the house to me is Beto, but it's to early for him. I don't know what it is that makes almost all politicians as boring. Bill and Ronnie weren't. I also think Carter wasn't and then became boring. Trump isn't boring...But not in a good way. I really don't care for Trump and his ilk, but I just can't bring myself to go out and vote for the party that calls me a racist for using the term "monkey"
It was a dog whistle, to expose hypersensitivity to dog whistles, and somehow get votes that way? I think Trump's moron base really was fired up. They still are. He's wildly popular still with the people who voted for him. These people...they are not like the people, even the conservatives, who post here. I really DON'T believe Distracted is who he wants us to believe he is. This is all nonsense. He is suggesting that we all think that his generic use of the term 'monkey' makes him a racist in our mind. I doubt he's that obtuse. I don't believe for one second that he's so oblivious that he can't see the difference between simply saying the word 'monkey' and saying 'monkey it up' by electing my black opponent. I suspect Republicans will be trying to make Christian Rivers the new Willie Horton. Bush won with over 400 electoral votes while the Democrats captured all of the pro-Willie Horton vote. I just think his hypothesis, that it was intentional dog-whistling, but strictly for the purpose of being able to scream about "liberal over-reaction!"... is still racist dog whistling. I mean, going "Nuh-uh! Y'all are imagining things!" is how racists roll now, when they're not going full metal Trump and seeking the open endorsement of the KKK. Is that the guy who killed the Tibbetts girl from Iowa? I think that could backfire. Her parents are angry as hell at the Republicans making his daughter a political football. I see his remarks to be patently disingenuous. Never have I heard someone insult people as much as Trump did and everybody goes crazy when Hillary calls some of his supporters deplorables? This is making an excuse to be offended as is Distracted saying this. And this is EXACTLY the same behavior. He wants a political party to give him permission to act like a racist. Otherwise, hes going to the side that wants to gut Health Care, Social Security, give tax cuts to the rich, freeze wages as well as eliminate consumer and environmental protection? Trump's "Mexicans - they're rapists!" strategy. I 100% think he was out of line with that statement, and that he was appealing to the some of the nativists in the GOP. That said, Mexicans are not a race. At worst you can say of that statement that it is bigoted, not racist. Man, I'd be running for cover under racist if I could get away with it! Bigoted takes things into a whole 'nother league! And you well know (as soon as you stop pretending not to) that racism has taken on a panoply of connotations. It's very hard to specifically pinpoint separately the chauvinism, the jingoism, the xenophobia, the religious bigotry and the racism. Do you have friends who get confused because they don't understand how the term is now used? Get new friends. TBD normally handles grammar lessons, being all smart and stuff, but he's busy apparently, so I'll school you for free. When Mexico sends its people, they're not sending their best. They're not sending you. They're not sending you. They're sending people that have lots of problems, and they're bringing those problems with us. They're bringing drugs. They're bringing crime. They're rapists. 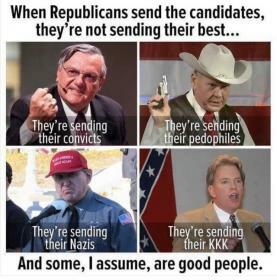 And some, I assume, are good people. Last edited by Foolmewunz; 1st September 2018 at 10:47 PM. See those first yellow parts? Those are the antecedents to the pronoun "they" (in "they're"). He is precisely and literally saying that Mexicans are rapists. (Unless you're claiming that MEXICO is sending some other people, say, White Norwegians, and those people, not the Mexicans, are the bad 'uns. I guess this means some Norwegians are good people. Hawk_One will be so pleased to know. i think the quote is bad either way but I don't get the insistence that he said "They're rapists". Clearly he is giving a list of things he thinks Mexico is bringing over. "they're not sending their best." So, what problems are they bringing? Why would the meaning switch to "They are" just for the last one? It's already bad but it doesnt need to be worse!! Last edited by Sherkeu; 1st September 2018 at 10:38 PM. Huh? And, No! It starts with "They're not sending you"(repeated)... "they're sending" starts the next sentence and the next and the next. Why would Captain Illiteracy change to "their" in the final statement? "Mexico -- They're good people." Last edited by Slings and Arrows; 1st September 2018 at 10:59 PM. They're bringing (their) drugs. They're bringing (their) crime. They're bringing their rapists. It doesn't make sense the other way. But that's just my common sense interpretation. It doesn't make much difference. He never used the possessive word "their" in the sentence. The last one being "their" would have to be a one-off. "They're not sending you. They're not sending you. They're sending people that have lots of problems, and they're bringing those problems with us. They're bringing drugs. They're bringing crime. They're/their rapists." He starts by saying "They're not sending their best." Then he goes on to list what they ARE sending. They're is always followed by a verb. It makes the least sense to say he switched for the last one. It's a disaster of homophonic proportions! Lets substitute baked goods here. "When Mexico sends us baked goods, they're not sending us their best. They're not sending eclairs. They're bringing donuts. They're bringing cupcakes. Their fruitcakes. And some, I assume are good foods. " “When do we beat Mexico at the border? They’re laughing at us, at our stupidity. When Mexico sends its people they’re not sending their best. They’re not sending you; they’re not sending you. They’re sending people that have lots of problems, and they’re bringing those problems with us. They’re bringing drugs. They’re bringing crime. They’re rapists, and some, I assume, are good people. But I speak to border guards and they tell us what we’re getting. Last edited by Slings and Arrows; 1st September 2018 at 11:40 PM. nods This also explains those comments about Judge Curiel, and those two supporters of his who beat up a homeless guy because he was Latino. And his ignorant repeat from earlier this year as well. I'm glad you feel that way. It appears we're getting through to you. Can I book you on a walking tour of the barrio? I've got a few friends who'd love to hear your ideas on inclusiveness. He was saying that they aren't all deplorable? Okay. Sounds reasonable. I'm glad to see that's a distinction you recognize and approve of. I don't know if Trump misspoke, or if his speech was improperly transcribed. But from reading it, it looks like he said: "some rapists are good people." Last edited by Slings and Arrows; 2nd September 2018 at 04:29 AM. Well, he doesn't have a lawyer named "The Fixer" for no reason! The man moves in different strata then the rest of us. Meh? I don't know enough rapists to be able to say that there are some with good qualities. Do you not find it just a little disingenuous to add the "my black opponent" to the quote? Was there a Pro Willie Horton vote? Or is that just another disgusting right wing meme you've picked up in your search for clever one-liners? No. He just didn't use those words. He was referring to his opponent who happens to be coincidentally black. Again, you are stretching the truth. He never called his opponent a monkey. Stretching someone's words beyond what was actually said, when it is entirely possible that those words were completely innocent, in order to apply a "racist" label to them makes one seem to be determined to stick that label on anyone. This behavior is off putting to some. ED to Add: this morning on MSNBC, Gillum used the expression : "when one wrestles with a pig you both get dirty, but the Pig likes it", a quaint expression which I may incorporate into my lexicon. It is unfortunate, however, that Gillum sees our law enforcement agents as "Pigs". Many people have a more charitable view of those who put their lives on the line to protect us. Last edited by Distracted1; 2nd September 2018 at 07:44 AM. That is a reasonable assertion. For those that agree with you, how does the accuracy of your post make the statement by Trump less reasonable? Back in the 40's, Truman spoke about "Trojan horse suggestions" made by people about whom he said "I suspect the people handing out this advice are not really well-wishers of the Democratic Party." It's almost as if many of my fellow Democrats would push away a supporter, not because they fail to support Unions, Environmental Protections, public schools, universal healthcare, equality of opportunity, gay marriage, net neutrality, et..al..
No, they need to be pushed away because they think it is a mistake to start yelling "racist" at someone who uses the term "monkey this up" when there is someone who is black involved. Now youre just trolling. Gillum wasn't referring to the police but it sure as hell sounded like Desantis was talking about Gillum. But you know what. None of that matters as we are not talking about Desantis we are talking about you and your support of a party that stands up for better health care and social security and workers rights and consumer and environmental protection. Or the one that stands up for dog whistles. This is why I believe you're a poser. Because me, I don't amputate my foot because I have a blister. The only evidence that it is a "dog whistle" is the insistence by some that it is. Insisting that Gillums use of the loaded term "pigs" is just as un-falsifiable of a claim, that is why I posted it. It took what? 20posts? To go from an observation that we would be better served not making "RACISM!!" the be-all end-all rallying cry of our party (to the point of requiring any potential supporter to "show their papers" by labeling a potentially racist statement as definitely a racist dog whistle) to :" you are a poser ". Have you forgotten that in order to win a (statewide) election we actually need to get more votes than the opponent? I'm really amused by the notion that talking about how some monkeys are articulate really might be a dog whistle, but it's not "legitimate racism" if it was part of some elaborate trap. It's not a dog whistle if it's a "nuanced attempt" to paint your opponents as hysterical! I have never denied thepossibility that it was a calculated statement. In fact, I offered what IMO would be a more logical calculation if indeed it was.